Let’s face it, no one can do it all. Building a house is your priority, but what’s outside is critical for boosting property value and providing the lifestyle homeowners seek in South Florida. By outsourcing pool and landscape design and installation—including pool and spa construction, landscape design and installation— you can save time and resources. 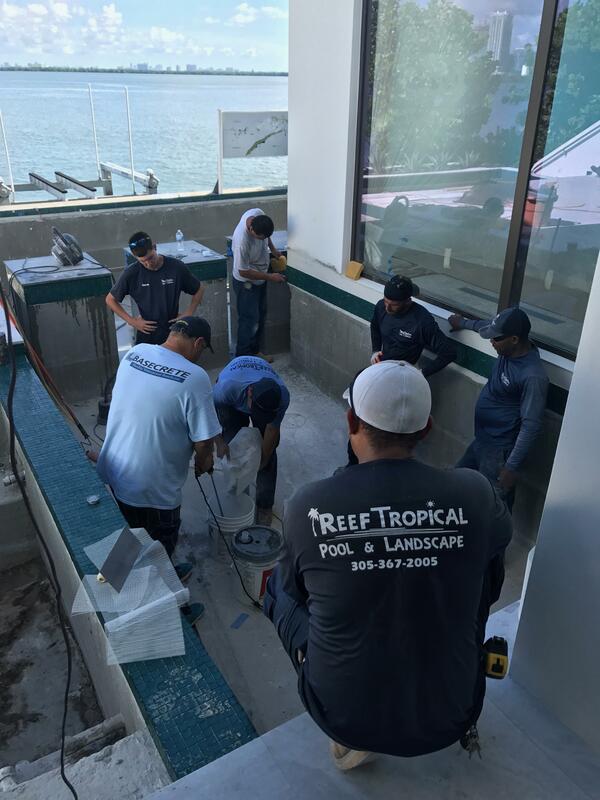 Reef Tropical has partnered with general contractors in South Florida for 20 years, and there is virtually no pool, spa or landscape issue we haven’t dealt with in our market. That’s why sophisticated general contractors including Coastal Construction, Suffolk Construction and Brodson Construction, among others, rely on our team to manage specific tasks related to the pool or landscape, or to take those components of their property developments from conception to completion. (Most turn the keys over to us because they know we are the pros in this space.) We specialize in creating and maintaining an outdoor entertainment area. You put hours and even days into creating the perfect design for your clients. The plant selection, materials, layout, sun/shade angles, views from indoors and your artistic design style all blend together to form what will hopefully be the customer’s dream landscape. Let’s face it: The design basically becomes your baby. So it can be a bit stressful when it comes time to hand over your design to an installation crew, especially if you haven’t worked with them before. The finished product looks just like — or better than — you imagined in your head. You see their work and wonder if they even glanced at the design you spent so much time creating. To ensure your project is more of scenario No. 1, you need to find a landscaping company that has the right experience and qualities. Your pool should be the focal point of your landscape, and the surrounding plants you select to complement it matter. You’ve probably heard the saying, “Choose the right plant for the right place.” Well, that same rule applies to pools — with a twist. When landscaping around a pool, it’s important to consider the pool design — its style and shape. Taking this a step further, your home’s architecture also plays into choosing the best plants for around a pool. For instance, a Mediterranean-style home and pool with a vanishing edge will call for a completely different plant palette than a traditional home with a square, edged pool. Here in South Florida, many of the poolscapes we design for high-end residential and commercial properties have Mediterranean flair because of the popularity of that style here. So, let’s explore some common plant types you can pair with a linear pool dropped with a Mediterranean backdrop. 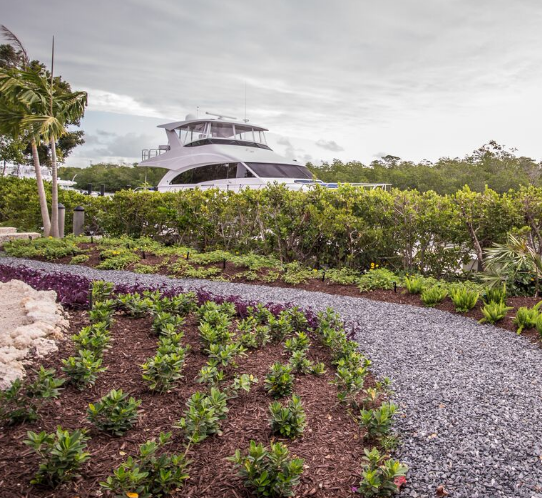 Together, these four plants will create a clean landscape with a range of green textures and white accents to complement the Mediterranean architecture. We are really excited about helping contribute our expertise to Jill Zima Borski’s “Landscaping Trends” article in the May/June 2016 edition of Distinctive Properties magazine. This real estate publication is brought to the residents of Ocean Reef by Russell Post, Sotheby’s International Realty. 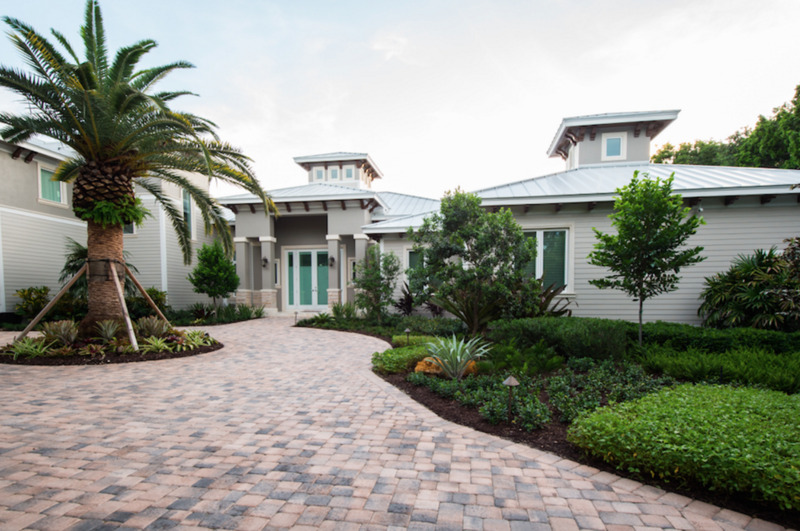 Landscape companies at Ocean Reef have a new challenge, thanks to Monroe County’s concern about storm water runoff. Water runoff from privately-owned properties has been shown to contribute to water quality degradation, especially of the Florida Keys’ nearshore waters. The county’s steady progress on central wastewater installation throughout the island chain — meant to achieve improved water quality — has led to new emphasis on tackling the additional threat of water runoff. High tides and sea level rise also are being taken into account in an attempt to improve potential flooding.